These Tents are used for general purposes, for Camping, over night stays, as receptions, for Relief purpose, or as Dinning Halls or even as barracks for soldiers in the military. 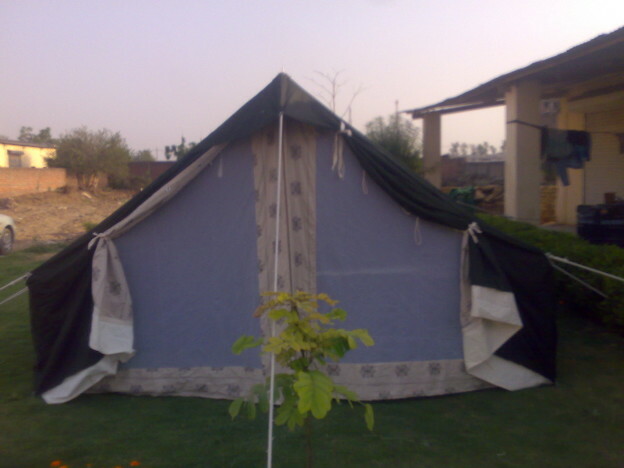 These General Purpose tents are also used as Living Tents by Army Jawans and during training purpose. We are the best Quality Army Tents Manufacturers in Delhi, India and we also export our Military Tents to South Africa. These tents are very easy to put up and very durable. Each tent is made up of a Single layer of water-repellent + rot resistant Cotton Canvas or two layers, outer of water-repellent + rot resistant cotton canvas in Olive Green color, with lining of cotton sheeting. The double layered Relief Tents are more long lasting and durable in terms of long use. Outer of water repellent Canvas in Olive green color, in the single layer tent, or with an inner of matching color fabric in the double layer tent. It can also have a zip door in the front with Mosquito netting for transparency and ventilation. This feature of the tents allows it to be used as a Living Tent for Sleeping and Dwelling Tents. All our Relief Tents and packed with Bamboo poles or Metal poles , wooden Pegs, Cotton ropes, tassels, Wooden pole tops. Everything required to set up your tent is included with the tent, you only need to buy and Iron Hammer to dig the pegs into the ground. We also make Tents for the Army, Military Tents and Relief Tents.